The actual historical moments of birth of the various arts are not known. At most, significant changes of direction are distinguishable – and these are usually detected retrospectively. However, the founding of eurythmy, a new art of movement, has been extensively documented. 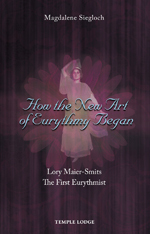 The story of the first eurythmist, Lory Maier-Smits, told in the pages of this profusely-illustrated book, is a valuable contribution to that legacy. It brings to life the pioneering period when the new artform was being developed under Rudolf Steiner’s personal instruction. Magdalene Siegloch traces Lory Maier-Smits’ biography with artistic care and loving detail. She describes the eurythmist’s early exposure to anthroposophy; her training under Rudolf Steiner from 1912; the first performance of eurythmy during the Theosophical Society festival in 1913; Rudolf Steiner’s lectures on the new art of movement; the staging of eurythmy under the direction of Marie Steiner; and Maier-Smits’ later work as a trainer of eurythmists. Also included is an account of Maier-Smits’ personal path of development, her marriage and family life. MAGDALENE SIEGLOCH (1917-2013) trained in eurythmy under Else Klink at the Eurythmeum in Stuttgart. After the Second World War she joined a eurythmy stage group formed by Klink, and also taught eurythmy and poetry in the Stuttgart training course, where she met Lory Maier-Smits. Later she spent time working in America, Mexico and Columbia. She is also the author of Eurythmie, Eine Einführung (1990).